These smoked salmon cucumber rolls look very elegant yet super simple to make. All you need is 4 ingredients to make these lovely appetizers. Their subtle flavor make it easy to serve with almost any meal. Combine softened cream cheese, chopped dill, and smoked salmon into a smooth spread. Using a vegetable peeler, peel the cucumber into thin strips. Spread the smoked salmon spread onto each strip and roll up. 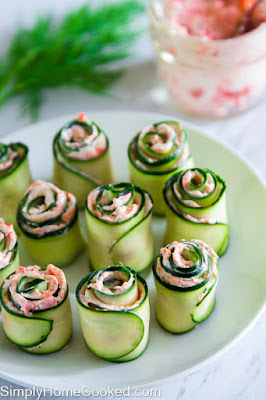 0 Response to "SMOKED SALMON CUCUMBER ROLLS"